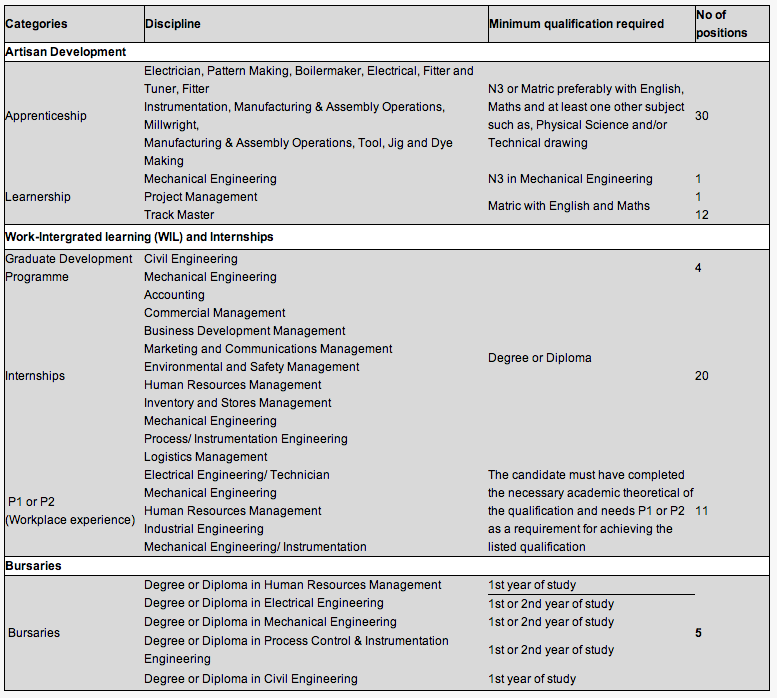 Aveng Manufacturing invites applicants to apply for “Internship, experiential learning, learnerships Programme and a bursary scheme”, for various disciplines .The programmes are offered for a period of 12 Months with effect from 1st March 2014, only to South African citizens. Successful candidates will be required to sign a contract for the duration of the training period. The placement of individuals for permanent positions who successfully complete the programme is solely dependent on the availability of a suitable vacancy, therefore permanent placement is not guaranteed. Please ensure that the subject title includes the Category and qualification you are applying for: e.g. Apprenticeship – Fitter and Turner, Learnership – Project Management, Graduate Development Programme – Civil Engineering, Internship – Accounting, Bursary – HR and P1 or P2 – Industrial Engineering etc. No faxed applications will be considered. Closing date 22 January 2014. For more information and further application instructions, click here.